BUDAPEST (Reuters) - Hungary's pro-government media continued to publish anti-EU messages on Wednesday despite a promise by a government official to halt the campaign during talks with a centre-right European grouping on Tuesday. Government billboards against an EU chief and the U.S.-Hungarian billionaire George Soros were among the grievances of members of the European People's Party (EPP) which are seeking to expel Prime Minister Viktor Orban's Fidesz party. A dozen of about 80 members of the EPP, the largest grouping in the European Parliament, felt Hungary had violated its values so badly that it should be kicked out, even if that weakens the group just before Europe-wide elections. The European Commission, which is also in dispute with Hungary over what is says are challenges to the rule of law, has dismissed the attack campaign, which suggests that it seeks to flood Hungary with immigrants, as fiction. Crunch talks on Tuesday between Orban and EPP group leader Manfred Weber failed to resolve their differences, meaning expulsion is still possible. Orban's chief of staff Gergely Gulyas, who is also a Fidesz vice chairman, said on Tuesday: "The hoarding campaign has finished; from now on members of the public will see hoardings promoting the government's family protection action plan." But full-page adverts were in several pro-government dailies and continued on state television on Wednesday. 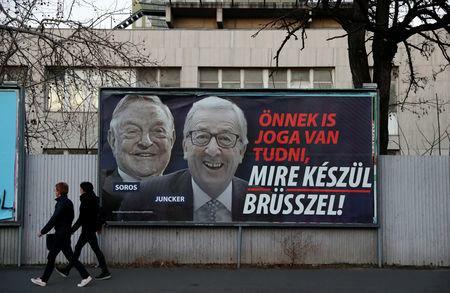 The adverts, which depict a smiling head of Soros behind a grinning EU Commission President Jean-Claude Juncker, an EPP member, say "you have a right to know what Brussels is planning" - the same as the billboards that sprung up across the country. The ads go on to list purported EU moves to ease immigration, such as easier visa access or cash payments to immigrants. The commission says they are a "conspiracy theory". A government spokesman said Hungary only undertook to end the campaign by March 15. The EPP is the largest party in the European Parliament, and is expected to remain the strongest despite its eroding support and gains by populist parties, polls have shown.